Horseradish, fennel, and dill happily join forces in this bold purple slaw to offer a punchy, crunchy counterpoint to other picnic fare. In a large bowl, toss the onion with the lemon juice and a pinch of salt. Let marinate for at least 10 minutes. Remove the tough outer layer of the fennel bulbs. Using a mandoline or a sharp knife, thinly slice the bulbs crosswise. Add the fennel, cabbage, carrot, parsley, and dill to the bowl of marinated onion. Sprinkle with 1 teaspoon salt and lightly massage the mixture with your hands for about a minute to wilt the cabbage a bit. 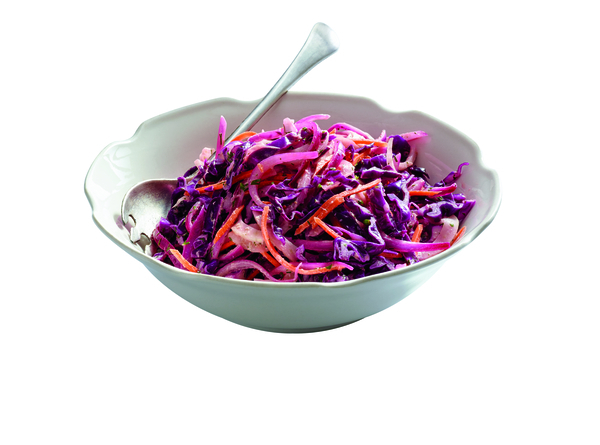 Let the slaw rest for 15 minutes, discarding any liquid that collects in the bowl. In a small bowl, whisk together the horseradish and vinegar, then whisk in the olive oil. Toss the slaw with the vinaigrette and the mayonnaise and serve.